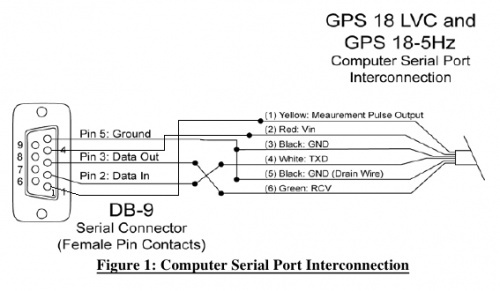 103696 is an adapter board used with the 10369 interface board to connect NMEA 0183 serial GPS devices to the Elphel Model 353 camera. Adapter provides 3.3V/5.0V (jumper selectable) power to the GPS device, communicates with it over RS-232 (+/-5V) TxD/RxD lines and uses optional synchronization pulse (usually 1pps) from the device. It includes USB-to-Seraial converter chip that allows full communication with the GPS device using the camera software, additionally the RxD signal is fed to the camera FPGA, decoded and logged in the camera sytem memory buffer - together with the optional IMU data, each message with the microsecond resolution timestamp. The source of the timestamp even is selectable among synchronization pulse from the GPS (either polarity), the start bit of the first NMEA sentence afther the pause or the start of each individual NMEA sentence. Current FPGA code allows programming of up to 4 different NMEA sentences that are recognized, decoded and logged. 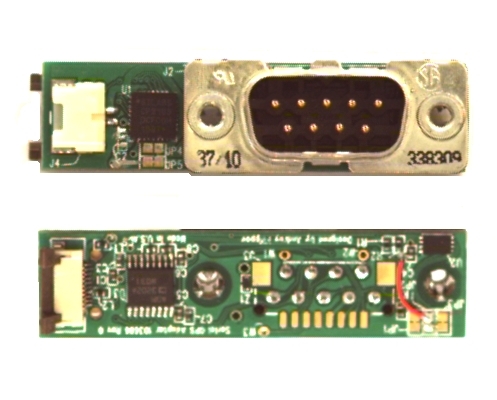 First option is used when the board is mounted on the camera body and the connector extends outside for the external GPS, the second - when the GPS is mounted inside the camera body. In that case the DSUB mounting holes are used to mount the 103696 adapter board. The power voltage level is set with JP4 and JP5 jumpers.